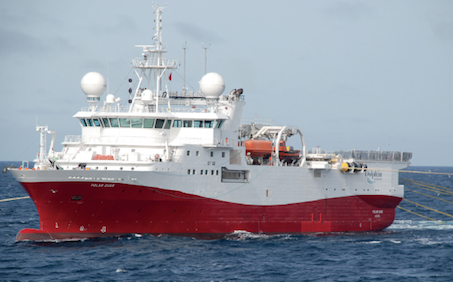 Oslo: Oslo-listed Dolphin Geophysical is mobilising the 7,700 dwt 3D Polar Duchess for a joint venture agreement with TGS to handle a 4,500 sq km 3D multiclient seismic survey over the western part of the Hammerfest Basin in the Barents Sea. The GC Rieber owned vessel from 2011 is one of eight ships with 2D, 3D and 4D requirements in Dolphin Geophysical’s fleet. Successful exploration of the remaining resources in the Hammerfest Basin could provide the key to commercial production developments in this part of the Barents Sea. The joint venture is good news for seismic expert TGS who is also listed in Oslo. Earlier this week, TGS introduced a cost reduction program reflecting the deterioration of the market for seismic data seen in the first quarter of 2015. A key element of this program was a reduction of more than 10% of TGS’ global workforce effective from April.